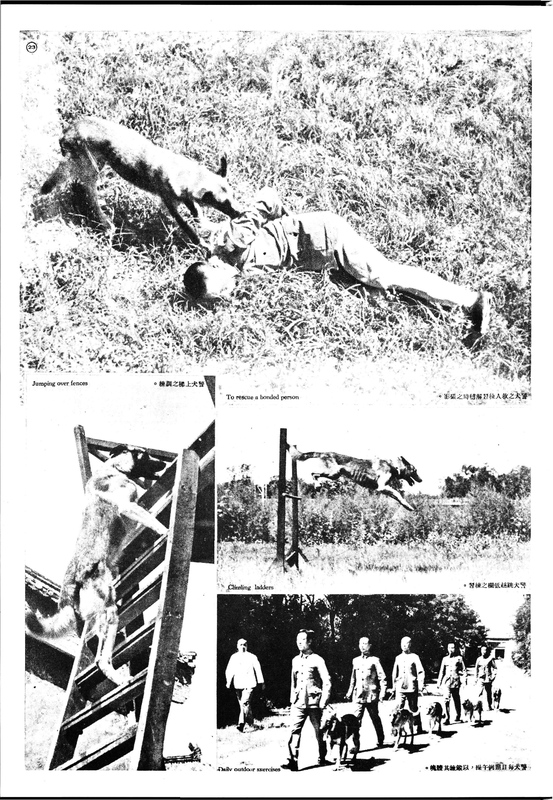 From a spread entitled “Training Police Dogs” 警犬之訓練 in the November, 1935 issue of The Young Companion [Liangyou 良友], a Shanghai-based illustrated monthly magazine. Photographs by WEI Shouzhong 魏守忠. Apologies for the fuzzy picture quality (click to enlarge). 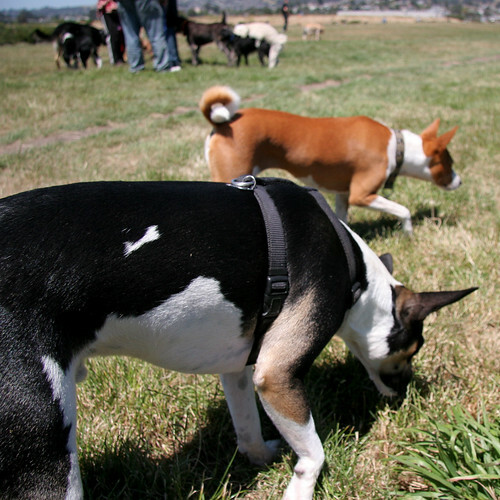 The dogs in this article appear to be primarily Shepherd dogs (Malinois, GSD, etc.) 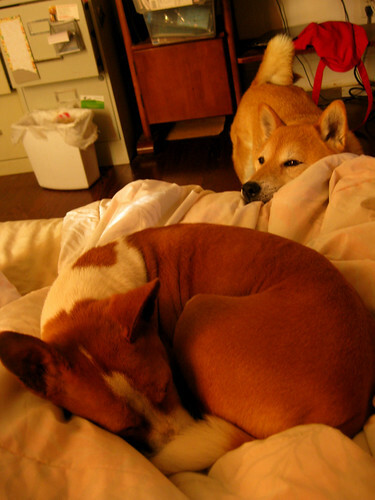 that are generically translated as “wolf dogs” (狼犬) whether or not they have actual wolf ancestry. Not all the text is clearly visible either. I’ve transcribed what I could below. There was one significant portion that was not translated into English, so my rough translation is included in italics. 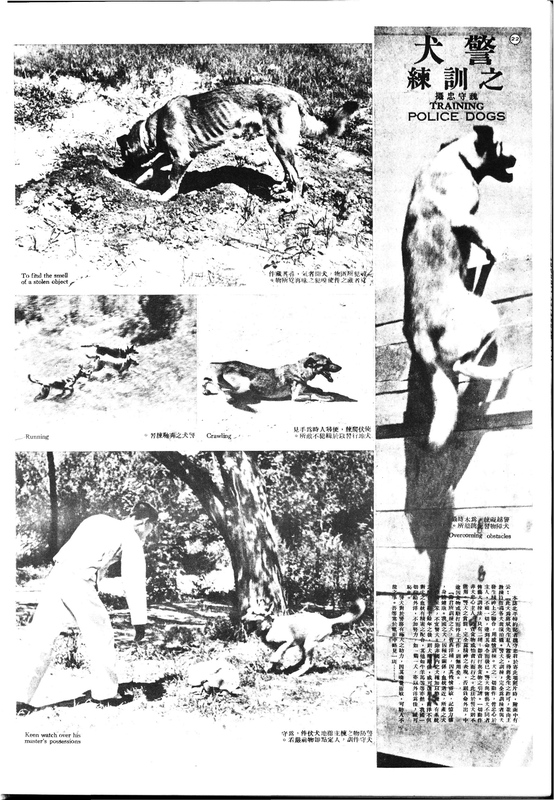 When this magazine commissioned these pictures from the reporter, Mr. Wei Shouzhong in Beiping (Beijing), attached to two were these notes: “These dogs are being raised privately by Mr. Jiang Bin. The dogs’ performances were photographed with his permission, and under guidance of trainer Wang. The training of police dogs depends entirely on the synergistic energy of the trainer and his dog, using a combination of authority and affection. The dog’s every action comes from his devotion to his master, with no concern for anything else. Achieving the command comes first; all the rest follows. The difference between police dogs and traditional dogs is that there are only two ways to train traditional dogs: with punishment by beating and with the lure of food. None of their actions come from their devotion to their master, but rather from their desire for food or their fear of punishment. These are not methods that can be used on police dogs. The reward and punishment of police dogs is entirely dependent on spirit of behavior, or else when it comes time to put their life on the line, they may stop mid-path for want of food or fear of blows, and thus be rendered useless indeed! “The dogs trained by Mr. Jiang are all Western breeds, because they are quick and intelligent in spirit, strong of memory, and hale of body. As for dogs of our country [China], because of [canine] race relations, and the closeness of bloodlines, the dogs bred are dull and stupid, and thus not appropriate to become police dogs. Unless we organize the breeds in our country, employ a systematic method of breeding, after ten or so years, it would follow that breeds would gradually improve, and could be used selectively. The West not only attends to the pairing of canine bloodlines with precision, [livestock animal husbandry] of cows, sheep, horses, etc. is also like this. We rely on foreign countries for everything. If we don’t increase our efforts, foreigners will have the advantage even when it comes to a single chicken or dog — a disgrace indeed. Yesterday, I was loosely trailing a couple of gray-haired women and their pack. From the looks and sounds of it, they were new dog walkers, and perhaps new to the park too — though they already seemed quite familiar with their charges (including a Decker Terrier! — more on him later). One maltipoo apparently had to remain on leash because he couldn’t resist the urge to hump the other small dogs. As the two women were wondering out loud about how to curb the maltipoo’s behavior, another dog park regular intervened with his advice. “You can just ignore it, and they figure it out with each other,” he said. “Most dogs will tolerate it until they’ve had enough, and they’ll tell each other what their limits are.” Fair enough. That’s usually my approach, too. “If that’s what you’ve gotta do…” Then he proceeds to tell her that after she pulls him off, she should hold his muzzle, because “It’s a dominance message.” And if that doesn’t work, she can put him on his back, and if that doesn’t work, she should smack his muzzle sharply and stare him in the face while telling him no. “But I don’t want to do that,” says the woman. Was this guy even listening to his own contradictions? Why bother smacking them in the first place if he actually believes they’re going to forget all about it later? Yeah, I have a million reasons why I would never trust Bowdu with a dog walker or sitter. Anyway, the two women politely suffered the man’s awful training advice until they eventually extricated themselves from his nonsense. When I passed them again on my way out of the park, they were speaking to another, experienced dog walker. I caught a snippet of her trying to set the record straight. “Dominance isn’t the issue. 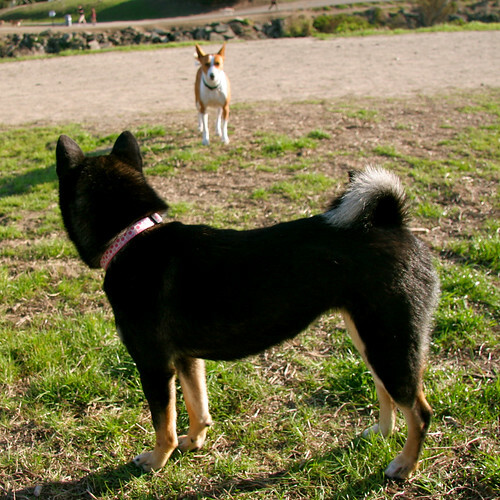 I wouldn’t really listen to that guy…” The other dog walker suggested keeping the pack constantly moving, because she noticed that they lingered too often. When they stalled, that’s when the maltipoo turned to the other dogs for stimulation. And if he really gets too distracted to keep up, then he should be leashed — because sometimes that’s what needs to be done. It’s a far better solution than smacking a client’s dog… or your own, for that matter. I left smiling. I’m glad some folks around here have some actual dog sense. Production Information: Warner Brothers, 1988 (USA). The accolades piled upon this crummy film is indicative of just how bad the eighties were for Hollywood drama. I’m not going to bother to summarize it, because you can easily find that info online. Like the marriage between Macon (William Hurt) and Sarah Leary (Kathleen Turner), the film drags on much longer than it needed to. Stiff and slack-jawed performances by a lackluster cast left me feeling woefully underwhelmed. The film’s primary redeeming feature is the adorable Cardigan Welsh Corgi named Edward. For a non-speaking role, Edward the Corgi is rather versatile, serving as a ballast for some characters, and propeller for others. He’s the most emotionally expressive character in the entire household, straightforward as only a dog can be about his joys, his fears, and his preferences. For Macon, he’s also a haunting reminder of his son, who was killed in a strong-arm robbery gone wrong. 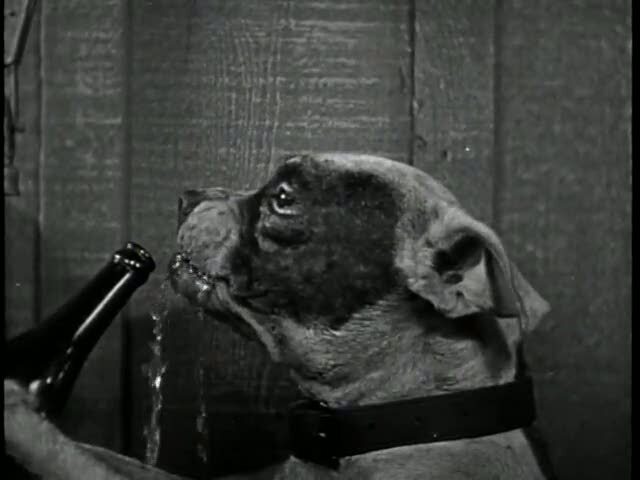 Despite his dog’s mounting behavioral issues, Macon just can’t abandon Edward, in part because of his crippling inability to either respond to his own personal tragedies or move on in the present. This dour, withered husk of a man seems an unlikely partner for Muriel Prichett (Geena Davis), a vet tech/animal trainer who inexplicably takes a shine to him and seizes the opportunity to insert herself into his life. 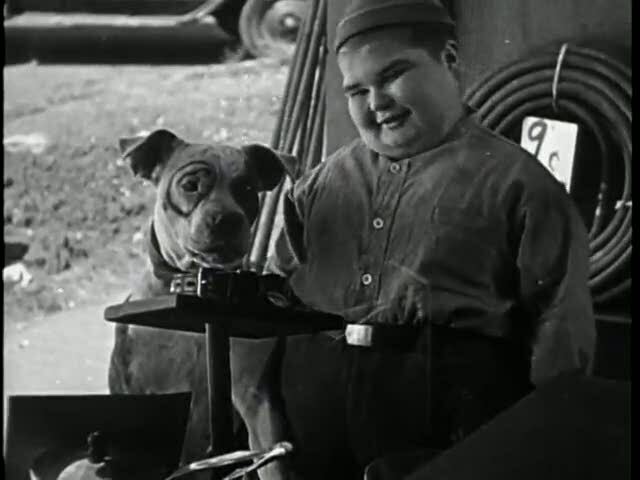 Muriel swoops into Macon’s life by teaching him to control his dog. This could have been a potent way to develop this odd couple’s relationship, but something’s lost in the execution. Instead of appearing skillful, Muriel comes across as a clumsy hack. Instead of revealing a more “nurturing” side that would counterbalance and give depth to her synthetic, flashy exterior, I find her domineering and insensitive, revealing her to be as blind to the dog’s not-so-subtle physical cues as Macon is emotionally passive. Let’s consider the the initial encounter between Edward the Dog and Muriel. Macon has just informed her that his dog was rejected from his previous boarding place because he bit a caretaker there. So seeing a dog in obvious distress, anxious about being at the animal hospital, and actively trying to avoid eye contact, what does Muriel do? She bends down and grabs the dog by the face. I’m assuming that even a rank amateur dog trainer, no matter what their background, would have known better than to start off that way with an unfamiliar dog, especially one that supposedly bites. 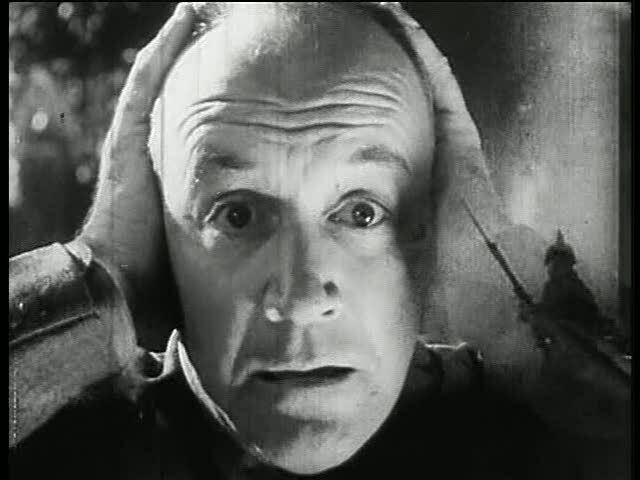 However, Edward just pins his ears back and goes stiff and licks his lips, sparing all audiences the ugly truth. This seems to be his default posture in many of his scenes, from when he’s being lifted off his stubby little feet by choke chain pops (several yanks punctuated by pathetic whimpering added to the soundtrack for deliberate effect), to when he’s left loose and unattended on the sidewalk in an extended sit-stay — all while strangers pass and pet the miserable-looking pup. Nowadays, if you know your dog has a history of biting and aggression, you’d be incredibly irresponsible to establish this scenario as an immediate training goal. Even if your dog was totally friendly, it’s kind of an odd risk to take… considering this is supposed to be downtown Baltimore! Times sure have changed. 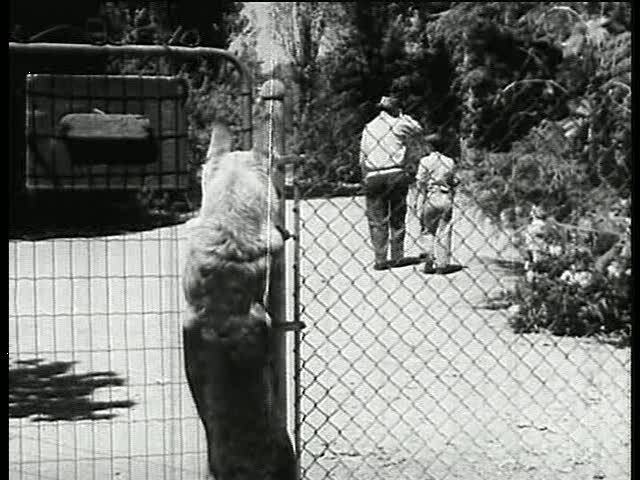 I guess such scenes are a reminder that this was considered by general audiences to be an acceptable standard of training and dog socialization back in the 80s, no matter how implausible a scene it would seem to us now. What further irritates me about Muriel’s character is that her methods are ultimately excused because hey, she’s Geena Davis! Praise for her performance even includes an Oscar for Best Supporting Actress. What could be potentially damaging or even disastrous in real life is presented as awesome and “quirky” here. I find that problematic not because I’m afraid others will emulate her methods (nobody is going to watch this to learn how to train a dog), but because her methods are enfolded into a more complex construction of character that makes it okay to ignore how your dog feels in favor of what you want him to do. And in this film, that certainly has repercussions for how people treat other people. I realize I’m probably reading this film anachronistically, looking for more “positive” training methods when such distinctions hadn’t even registered as a problem. Even now, these debates have yet to enter the mainstream, though I witness frequent skirmishes over training methods in my dog-centric circles. 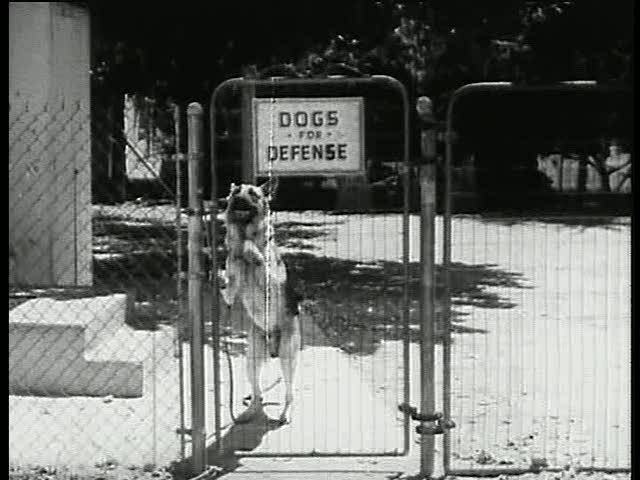 At any rate, since this is how Hollywood depicted dog trainers on screen, I wonder what was routine on the set! 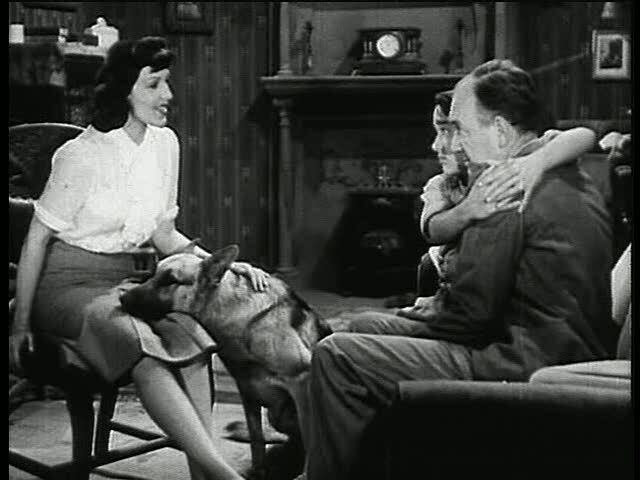 To offset these more egregious training scenes, at least there are moments where Edward appears genuinely comfortable and at ease, a reminder of the tender domesticity that a dog can provide, especially in the absence of any other kind of familial warmth. Edward adequately expresses all the charms of his breed, but a cute Corgi alone cannot redeem this movie. Happily, I tick this one off the list… so I won’t have to watch it (or listen to its awful soundtrack) ever again. Don’t worry — despite the dark humor of the opening images, everything turns out okay. 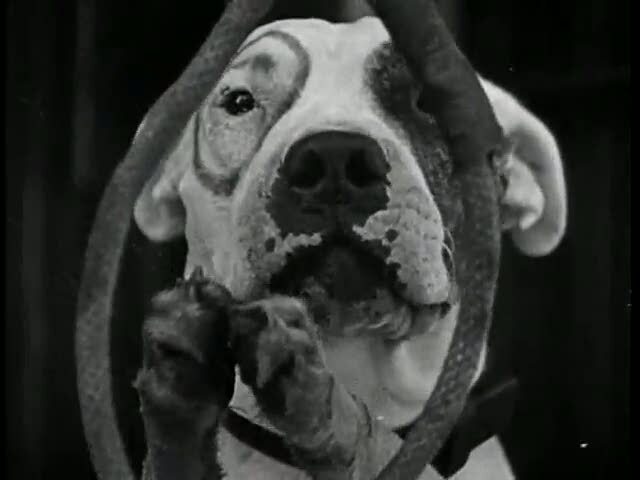 Pete the pit bull is one of the most famous of the Little Rascals, whose legacy has endured thanks to a combination of his peculiar markings (the product of Hollywood makeup artistry), charismatic canine acting, and contemporary breed politics. He was a fixture of the Rascals gang. Frankly, this is a great relief for someone like me, who normally cannot stand child actors. Pete’s presence greatly redeems the quality of these funnies that otherwise try too hard for my taste. 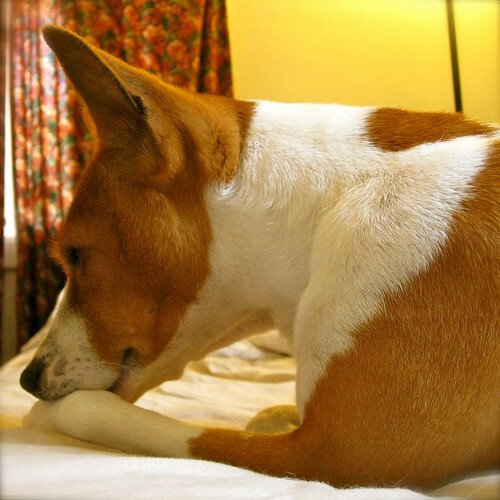 … Pete frequently is called upon to register astonishment by putting his paw behind his ear while sitting up on his hind legs. Due to a dog’s physical make-up, this is virtually an impossibility. How is it accomplished? 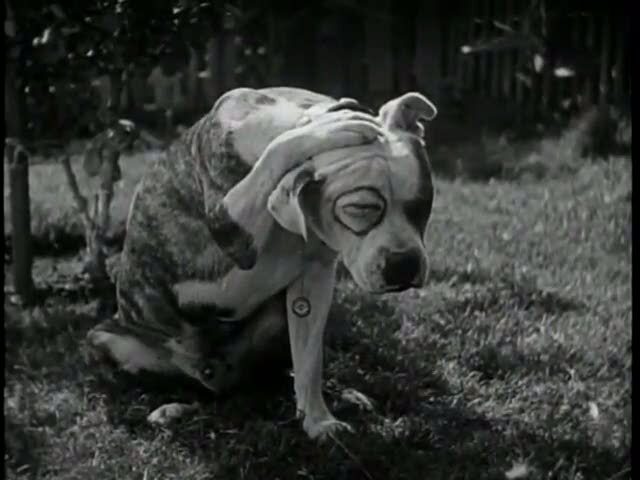 Simply by having the trainer place the dog’s paw behind the ear before starting the cameras and then shooting the scene in reverse action. A shot then is made of him sitting up in a natural position. In the cutting room the two shots are matched so the action appears to be simultaneous. He goes on to impart other pearls of dog training wisdom: “The early stages of training should be masked as play, says [Lucenay]. Thus, knowledge is instilled without making it a hardship” (ibid., 884). It’s an interesting article that suggests what we now think of as “positive” training, without getting bogged down in jargon or debates. 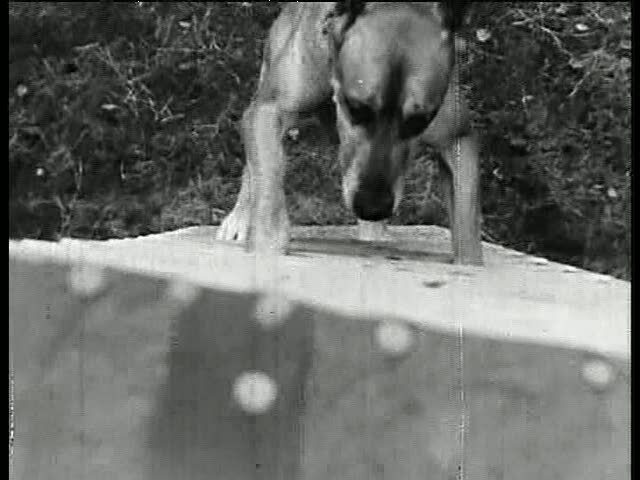 But it would take a lot more close reading to unpack just what’s going on here, since even the ideas of play and obedience, so critical to Lucenay’s training philosophy, are categories in flux — as evidenced by the comedic and satirical edge that early films like Our Gang shorts often display. 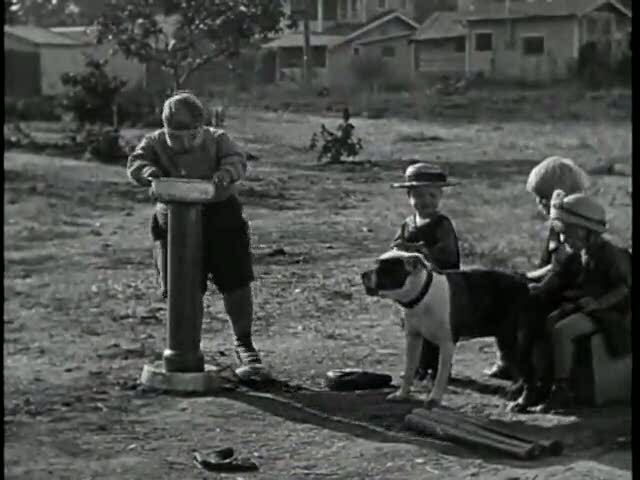 Anyway, if you want to watch a cute pit bull doing cute tricks with a cast of ingratiating and slightly creepy children, check out this or any number of the Little Rascals films. It sure must have been fun while it lasted. 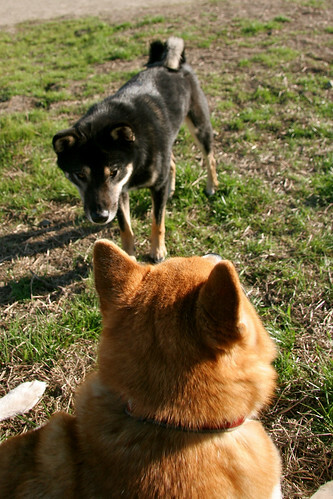 Bowdu met Belle, a young black and tan Shiba, for the second time. He wasn’t so nice to her the first time they met at the beginning of our stroll around the park. This time, they met at the end of the walk, so I guess Bowdu was in a more receptive mood… at least, at the start. He plopped down on the grass, apparently too tired to stay on all fours. Belle kept circling him and edging closer for a cautious sniff. Even though I thought Belle was being sufficiently deferential, Bowdu was irked. After a few approaches (which did elicit some warning grimaces from him), he blew his cool and launched himself snarling and snapping at poor Belle. She responded by screaming and tripping backwards over her dropped tail, but Bowdu insisted on haranguing her a bit more before I called him off. The confrontation only lasted seconds, still enough to visibly shake her. Nobody was hurt, and her owner wasn’t mad. Passing park visitors veered sharply aside, giving us wide berth. 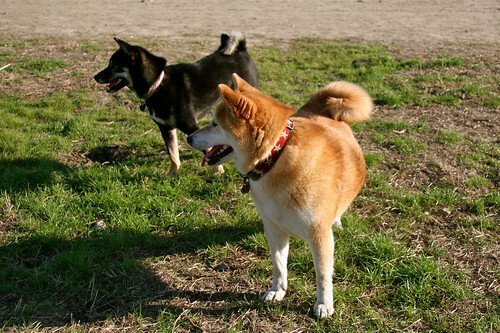 Between Belle’s shrieking and Bowdu’s barking, these Shibas certainly didn’t sound like dogs you’d want running with your own harmonious pack. “Sometimes she deserves it. She’s a little brat,” said Belle’s owner. I’ve thought similar things about Bowdu, until he gradually started taking the offensive position and moved to full-on jerk. While I was grateful for her tolerance, I still felt sheepish about Bowdu’s rowdy behavior — especially since in this scenario, her dog did very little to “deserve” this reaction. I’ve reached a point where I’m seldom apologetic about Bowdu’s gruff temperament. Some might even say it’s “hard-wired” into the breed. 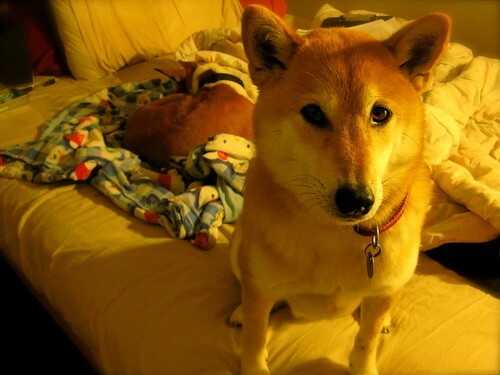 Rub enough Shibas together, and you’re bound to create some divas and devils out of the friction. Yet, I know it’s a cop-out to fall back on some reified notion of breed temperament in order to excuse myself for not having the world’s most perfectly trained dog. “Well-trained” doesn’t automatically mean gregarious though. In a way, Bowdu’s open disdain for the majority of dogs that he meets just makes our private, cuddly moments that much more personal. No doubt Bowdu could have made a great project dog for some expert trainer, because he can be incredibly responsive with the right motivation. But no one could’ve trained him to be nicer than he ever wants to be. 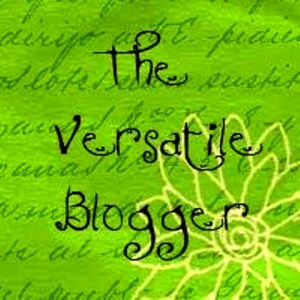 Perhaps you’ve noticed that training is one category absent from this blog. I’ve grazed the literature and have my preferences based on what works in my limited experience; any successes have always been a matter of contingency. Though we’ve put lots of effort into socialization, the Two Bows haven’t been systematically trained to do much. I only ask them to behave decently when enjoying some of the same things I do — taking long walks in the parks and woods, meeting and observing other dogs, going for meandering drives. Then again, I don’t know if I would have enjoyed these activities to begin with, had I not had the company of my dogs. They’ve done as much to train me as the other way around. 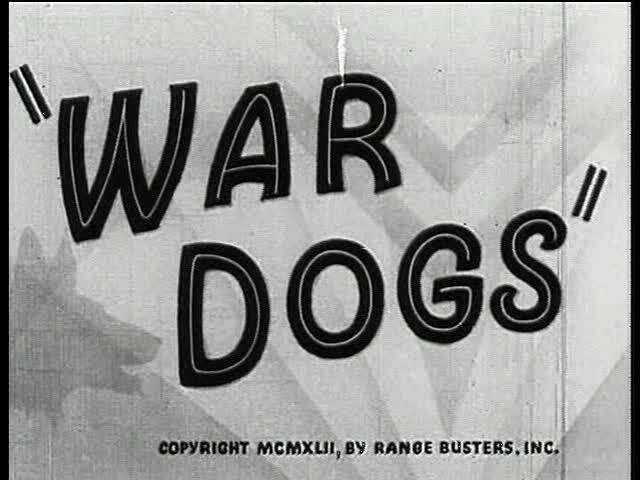 The war “dogs” in this film are both human and canine. Captain William “Wild Bill” Freeman is a World War I vet who has fallen amongst the legions of forgotten men in the aftermath of the war. Despite his patriotic fervor, he’s now considered too old and not specialized enough to join the fight in World War II. On the other hand, his son Billy is too young. The fact that there is no Freeman in the fight, on top of his unemployment, leaves him distraught and feeling helpless until circumstances bring a child welfare agent, Ms. Allen, to his home. “Say, have you ever heard of the Army Patrol Dogs?” she asks, trying to help them brainstorm a solution. “Those dogs have to enlist in the army, just like people do.” And thus begins the mission to transform the family pet, Pal, into a true soldier worthy of the Freeman legacy. I’m not giving a blow-by-blow of this film, because it’s pretty awful. There are no real characters to speak of. The bobble-headed kid reeks of so much gosh-darned earnestness, you just want to smack him. The “plot” takes so long to develop that it may as well not be there — though it comes complete with overwrought romantic intrigue, industrial saboteurs, anthropomorphized patriotism, and a tragic, heroic death (hint: no dogs die in this story). Indeed, the acrobatic army dogs-in-training show more talent than the hacks that jerryrigged this stinker. And the Freemans must sacrifice they pet they love for the good of the nation. However, as a piece of po(o)p propaganda that is roughly contemporaneous with Frank Capra’s masterful Why We Fight series, this film is somewhat interesting as an emblem of its time. Its messy overlay of fiction and documentary re-enactment is very symptomatic of that moment in Hollywood productions, as lesser filmmakers were mobilizing to incorporate the excess of wartime rhetoric into the folds of everyday entertainment. The entire production feels forced because on some level, everyone in Hollywood was forced to take part in rallying the nation towards the patriotic cause. 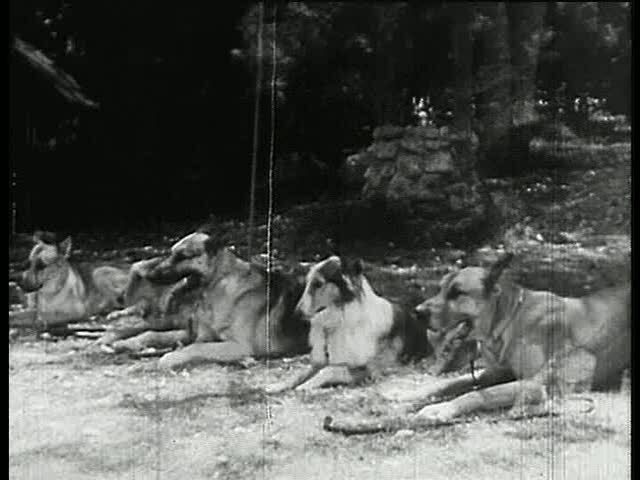 The most interesting parts were the newsreel-style footage of the training process. However, I couldn’t help but feel awful for the poor African American soldier who was forced to play “the enemy” during the drills. He was the one hiding in the bushes, beating the dogs, firing guns at the dogs, inciting them to violence — and thus, repeatedly taken down as “proof” of the dog’s successful training. 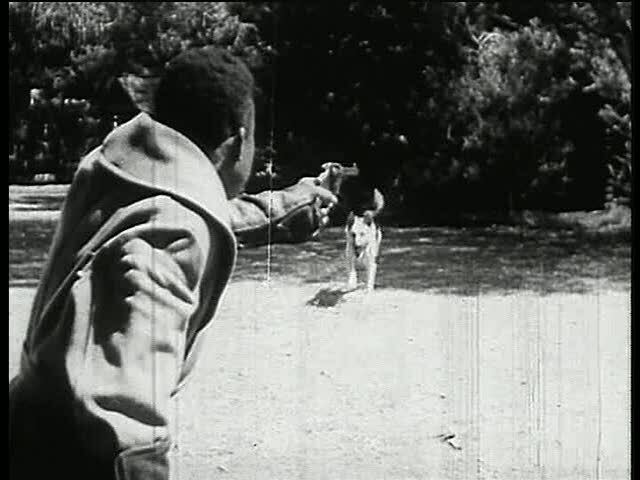 Not always a comfortable image to witness, especially when you think about black soldiers fighting alongside white soldiers (and ostensibly relying on the protection of the same dogs), and also when filtered retrospectively through similar images of Civil Rights Movement era violence. 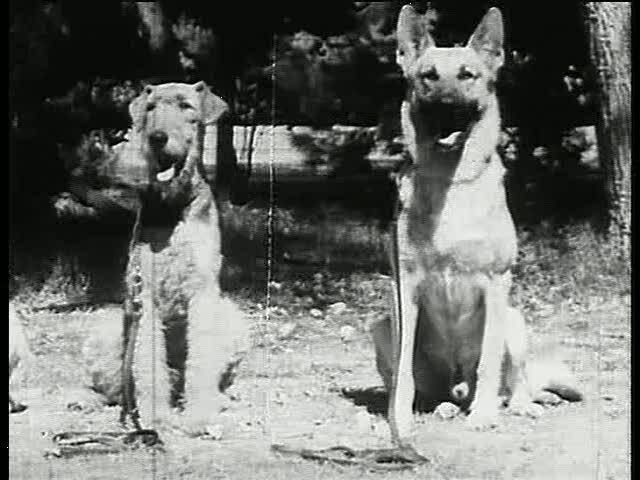 In my opinion, you’re better off watching some of the War Dog documentary training reels housed at the British Pathe online archives, like these: War Dogs 1 and War Dogs Reel 2 (1961); Dogs of War (1939); Canine Warriors (1941). But if you insist on checking out this title, it’s available as part of the Canine Collection 3-disc DVD set, or as a standalone title on a remastered DVD. EDIT 6 May 2011: Or you should check out this photo essay on war dogs by Rebecca Frankel for Foreign Policy. We’re in the midst of a warm snap here in the East Bay (temperatures in the upper 70’s in October!). Yet, the squirrels seem to know the seasons are changing and they’ve been more active lately. I can tell because Bowdu’s been chasing them along the backyard fence more frequently than usual, especially in the mornings. Bowpi, possessing quite a prey drive herself, usually wants to help, which causes Bowdu to turn on her, resulting in a terrible morning ruckus. It’s incredibly noisy, but it seems to be all bark and no bite. Bowdu turns to snap at Bowpi to tell her to back off and she SCREAMS in response, which makes him bark at her even more, which makes her scream DON’T YELL AT ME! It usually takes one of the humans just a few seconds to go out there and call it off, at which point Bowpi will slink sheepishly back into the house and Bowdu will stand his ground in the backyard and decompress. I think now that Bowdu’s on his thyroid medication, he’s a little more in control so that he’s fairly easy to check by vocal command. Bowpi is left temporarily shaken, but no worse for the wear. If anything, she’s strangely resilient to Bowdu’s tyrannical moodswings, because they’ve kissed and made up by afternoon dog park time, then they’re at it again the next day. She clearly gets the message that Bowdu doesn’t want her help, but she can’t stop herself from wanting to chase the squirrels, too. I guess this is known as “letting them work it out for themselves,” but some human intervention, or at the very least monitoring, is necessary here, I think. Knowing that squirrels can be such teases, and that Bowdu can be so territorial and reactive, I would never leave them in the backyard completely to themselves. This also seems to happen in the hour between when Bowdu gets his morning dose of Soloxine and before he gets his breakfast, so I wonder if he may be even more on edge. This morning, Bowdu chased Bowpi up against the neighbor’s fence, where an evil, thorny weed-bush has been known to sprout. Poor ‘Pi stepped on an exposed growth that we had not noticed poking up from beneath the fence. So this morning she came limping back inside with an injured paw. There were drops of blood on the cotton pad I used to wipe and disinfect her wound. You may have to hover over the picture on the Flickr site to see it, if you can’t tell where she was pricked. 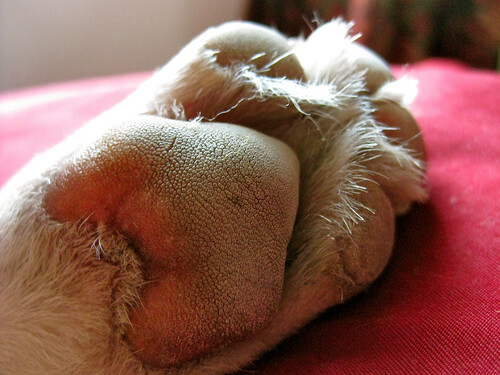 Wouldn’t it be something if we ended up with two dogs with infected feet?? I felt awful; we should’ve known those thorns were there. Luckily for Bowpi, she’s quite willing to submit to paw treatments. She had actually torn her paw pad a couple months or so after she joined us. I was inclined to fault her previous owner for seldom having walked her, so that her paws were (and still are!) tender and quite vulnerable to even the most normal of sidewalk hazards (i.e., mere concrete surfaces). At least she allowed herself to be swabbed up and bandaged with no complaint, so she healed super quickly after her first pad injury. Nope, she’s not nibbling. She’s just resting her head on her paw, appearing deep in thought. 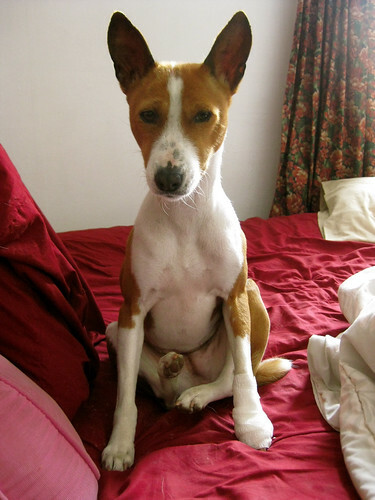 Basenjis have an ill-deserved reputation for being not very “intelligent” owing to some 1994 study of dubious merit. Basically, it sounds like they took a one-size-fits-all approach to evaluating dogs and rated different breeds based on how many repetitions it took for a dog to learn a command. No mention of what kinds of rewards (if any) or physical techniques were used, or whether the evaluators were even fit to judge, which leads me to think the entire study is hogwash. I’d hardly describe Bowpi as unintelligent, but rather, a dog who has a clear understanding of what she likes: sleeping, eating, snuggling, and exploring the outdoors (but not the backyard, which she uses for the occasional sunbath). These are activities she enjoys in and of themselves, and not necessarily suitable as training incentives. She certainly won’t respond “correctly” to every command, even a simple sit if you’re asking her to do so on bare floors. It’s one reason why she likes Pet Store A as much as she does, I think. Aside from the gourmet salmon treats they offer, they have carpeted floors, a rarity among pet boutiques. That seems to be the main reason Bowpi so willingly responds to their requests. Otherwise, she gives no indication of being willing to obey strangers — what’s the point, after all? I don’t think she got very much mental stimulation in the life preceding ours. Yet, I often see a twinkle in her eyes that makes me think she’s eager to process new things, even if she holds back on responding to them. We haven’t done much to train her, as she didn’t really come with any bad behaviors that needed correction. If anything, more pressure was put on Bowdu, as he had to learn to accept her constant presence and understand that she was not to be bullied. I’ll probably write more about their introduction at some other point. Suffice to say, this match worked largely because Bowpi is so introverted and doesn’t demand interaction, at least not at home. The most solid “new” cue that she’s learned from us has been Go to bed. That is, after sleeping all day on the futon in my study room, we’ll tell her to Go to bed at night, at which time she’ll rise like a serpent from her sea of blankets, and trot directly to the bedroom where she happily curls up against the nearest available human lump, and continues to sleep some more. It’s going to be a cozy winter. This post was drafted last week, when my parents blew into town for a brief visit. I’d been sitting on it because it’s a doozy. The story’s probably boring because it’s so common, but it’s been on my mind. One night I was invited to a dinner party at my parents’ friends’ home. Another pair of their college classmates who now happened to live in the area was invited. As the three couples reminisced and talked shop and vied for their turn to be loquacious, the topic eventually drifted onto the subject of pets. My parents somberly noted the recent death of one family cat, a dear calico named Lucy who had lived to be 18 years old. I was a kid when we first got her, but as I’ve not lived at home in over a decade, my memories of her have grown faded and her affections, if she had any for me to begin with, had long since turned elsewhere, specifically towards my mother. Another couple regaled us with stories of their cockatiel. Through their charming narration, expertly paced and animated with all sorts of facial gymnastics, I felt like I learned much about the manners in which birds express personalities. After dinner, I asked the hostess if I could see the puppy. I’d caught a glimpse of him, crated in the garage earlier in the afternoon. We entered together, she popped open the crate door, and out shot a quicksilver black form, slapping his paws against my body in glee, leaping four vertical feet to bounce off my chest. The hostess started yelling at him immediately. “NO. BUDDY. NONO.” She saw me turning my back to him and trying to ignore him (i.e., not reward him with attention) when he was climbing all over me, and started apologizing profusely, saying he should go back in the crate because “He’s going crazy again.” Well… he’s going crazy because he never gets any attention and I’m somebody new, I thought. I convinced her that it was all right, that we should give him a few seconds to get over his initial excitement, and that I was ignoring him not because I didn’t want to play but because I was waiting for him to calm down. “Oh, he’s not going to calm down,” she said. “He just gets more and more aggressive, and that’s when he attacks.” As she said that, Buddy leapt up and grabbed my arm. I felt the slightest pressure, like he was about to get his hump on, so I turned and told him to sit. And then he started jumping up into my face again. “That’s great! What’s ‘flat’?” I asked. She showed me how to do it, putting my fingers (with or without a treat) in front of his nose and pulling towards the ground until he was completely down on his side, tummy exposed. 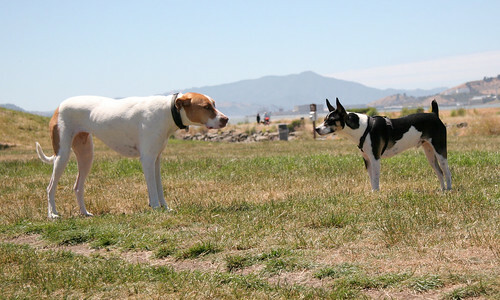 I didn’t know this command because we’d never trained our dogs to go any lower than a down/stay, as I don’t really see a use for this particular position — just as I avoid parlor tricks like “crawl” or “play dead.” I took it as an indication of our differences in training philosophies. No, they hadn’t, was the answer. They hadn’t taken him to training, because their vet had told them “It’s not worth it” with the extent of his “aggression” (I couldn’t call her out on a lie with no proof, but really?!). The family was working with him based on the mother’s prior experience with an easy-going, highly trainable German Shepherd, and consulting their in-laws with dogs — but this dog proved recalcitrant to all efforts. What I heard made me think the problem was less in Buddy, but with their approaches. The dog had already been through three other owners (including breeder) before them. He was neutered. He appeared to be quite healthy. His faults, as they assessed the situation, was that he was “too dominant,” that he’s an “alpha dog,” that he had some “aggression” that wasn’t adequately disclosed at the shelter they got him from. She said Buddy had been described as dog aggressive, but good with kids. The match did not live up to their expectations, and they felt burdened by a dud dog. Now, the entire family was avoiding spending time with him because they were being bowled over by their hyperactive, 20 lb., year-old puppy. Buddy had gotten loose once and charged and bit a neighbor’s dog. He “wanted to attack” every dog he saw on the streets so walking him around the neighborhood was a chore (the hostess was too nervous to let me walk him by myself, though I cheerfully offered to do so twice). He would get too worked up when playing with their only, elementary school-aged son, and so they weren’t allowed to be together unsupervised. Meanwhile, nobody in the family had the time to consistently train him and most importantly, expend some of his energy. He just sat in a crate all day, released for a manically blissful hour or so each day to annoy his family and terrorize the roses bushes in the backyard, before being tossed back into the crate in the garage for the rest of the night. What a life. No wonder the dog had problems. At this point, I went to fetch a sack of treats, which I still had in my bag from my park excursion with Bowdu and Bowpi to tire them out for my long evening. With a fistful of Zuke’s salmon training treats, we started playing “It’s Yer Choice” (this was recommended via knowledgeable folks at the Basenji Forums for a puppy who jumped up on people and nipped) while continuing the discussion. She said that she had contacted the SPCA about surrendering Buddy, but nobody could guarantee that he wouldn’t be put down — probably because she was describing him as a severely aggressive dog! However, what I saw was a dog that was 1) still very much a puppy with a lot of unspent energy, and 2) very capable of focusing, as he quickly knew to look up at me and sit nicely with his tail wagging by the fourth treat. If he had motivation and focus, then as far as I was concerned, he could be trained. They just hadn’t tried hard enough. “Alpha to the dog, but I’m YOUR alpha!” retorted his wife, and they laughed at their little domestic inside joke. I had nothing to say. Buddy was visibly more controlled in daddy’s hands, but I’m not sure that it was a matter of submission, and certainly not obedience… As soon as he was released, he resumed his whirlwind tour around the garage. It was time to move back inside for dessert, so Buddy was to be put away again, like a wind-up animal back into the toybox. That’s when Daddy started yelling at Buddy to get into his crate. Whenever he tried to dart away, he’d shout “NO!” in a really mean voice, and even stomped his foot a couple times, but it did not serve the end goal of getting Buddy where he wanted. Hoping to show how just a little reward was all he needed, I brought out the training treats again, told Buddy to sit (treat), told Buddy to stay (very good), then come to me next to the crate (treat), then “Get inside” (their command) — and then jackpotted him when he did. An easy-peasy three steps with absolutely no resistance. Note: This dog is still available for adoption if anyone who lives in the Bay Area/Northern California is interested.